Each month I have the honour to represent the BC Groundwater Association at the Okanagan Basin Water Board’s Water Stewardship Council meetings (yes another meeting). I’ve been on the Council for about 3 years now, and over this time, and now with the Water Sustainability Act (WSA), I’ve realized the value of a watershed-sized water governance. The Board’s entire focus is on water in this watershed, and the Council is made up all representatives from the main water users, including BC Cattlemen’s Association, BC Fruit Growers Association, some of the larger Cities and all three Regional Districts. The Okanagan Basin Water Board (OBWB) is funded in part by tax dollars from all of the local governments, which is obviously pretty huge. But, its two main strengths are getting all the water users in a room together to talk about common interests and challenges, and also, to have a staff of four to get things done. There are many grant opportunities out there, and the staff, along with guidance from the Council, are able to create successful partnerships and projects that are a win-win for many potential funders all the way from the Federal Gas Tax, to local partnerships with BC Wildlife Fund and schools. One of the main projects that the OBWB led, and that seems even more fundamental to me now with the rollout of the WSA, is the Okanagan Watershed Water Supply and Demand Project. Every single square inch of land in the Okanagan has been assigned to an aquifer recharge area, and each aquifer has basic properties estimated from borehole logs and geological maps such as gradient, hydraulic conductivity, size, and recharge and discharge values. These aquifer properties have been connected to surface water values, and a full water supply and demand balance has been realized for the watershed. This has helped to focus future research in key areas, because we now can rank aquifers by size, and vulnerability to changes in climate or population growth. Going forward with the WSA, I can’t see how we can issue licenses without understanding something as basic as a water budget at a watershed level, and at the very least, mapping and assigning of all lands to an aquifer within a local watershed, not just where there is data. Sometimes, when assessing groundwater recharge and discharge, it is easier, and cheaper to assess all the other components to a water budget (surface water inputs, and water use, for example) than it is to estimate groundwater parameters, and groundwater becomes the “remainder” of the sum of all the other water budget inputs. 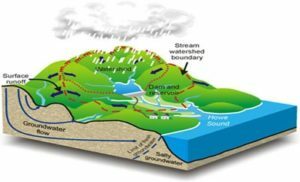 Without watershed boundaries, and aquifers mapped across the entire watershed, a water budget is not possible. The problems we need to solve are too big for individual ranchers, or small local governments to solve. We need to pool our resources (a nice way of saying taxation) at a Watershed scale to solve these problems. I have a map of all the watersheds in BC. There are 9 “Level 1 Watersheds” in the Province: Mackenzie River, Fraser River, Columbia River, Skeena River, Nass River, Stikine River, Taku River, Yukon River and Coast and Vancouver Island (which discharge directly to the Ocean). While I’m sitting in the Council meetings, I think: how can the lessons learned from the OBWB help the other Watersheds in BC to better understand their water resources and does BC need to move to a Watershed-scale governance model to manage water woes and help roll out the WSA across BC?